Will be switching to Orcon 1gps UFB soon and would like to upgrade my networking gear to Ubiquiti. The gear I was thinking about buying was an Edgerouter 4, Switch and 2 x Unifi AP AC Pro. I have a few questions before I decide to switch to Ubiquiti. 1. What are the Orcon UFB settings for the Edgerouter 4. I know @michaelmurfy has a guide to setup up the Edgerouter but he is with a different internet provider so I thought his settings would not work on Orcon? 2. When using Edgerouter 4 on Orcon can you get 900mbps or more for download and 400mbps or more for upload with Orcon 1gbps plan? 3. How do guest networks work when setting it up on the Unifi AP AC Pro. Does the guest network get put on a separate network where they cannot connect to my main network devices such as Sonos and Chromecast? Don't get the Edgerouter 4, go for the UniFi Security Gateway instead along with a UniFi Switch since you're grabbing the UniFi access points. I recommend also grabbing a Cloud Key. This achieves Gigabit speeds no problems. Orcon is IPoE (DHCP) on VLAN 10. @michaelmurfy cheers for the advice. At the moment I will get USG, US-8-60W Switch and 2 x Unifi UAP-AC-Pro. May get the cloud key in the future. If I do decide to get ER-4 instead of USG what are the differences in terms of the pros and cons? Seperate management between the ER4 and the USG - the ER4 is designed to be an advanced device. You're better to UniFi everything in this case as the USG is an advanced device also, and it is highly unlikely you'll get any improvement going for the ER4. That way, one portal for everything. It is important you also have a UniFi controller. Take a look at the cloud controller in my signature. Just a comment to backup what michaelmurfy says - REALLY think about the controller - I set up mine on a Macbook when I first got my Unifi gear, and I no longer use that machine, and its a pain to keep the controller up to date and to have to start it (to manage the network) when someone else is using that machine. The Key fixes this, or as michaelmurfy says use his cloud key. If you want to keep it on premise there is also an image for Raspberry Pi's. Just note that you don't need the controller running at all times, only when you want to manage / view the Unifi parts of the network. I also do a lot of gaming as well and have a lot of devices on my network @michaelmurfy. Would an ER-4 be able to handle more devices and be able to achieve an Open Nat Type on my consoles as it is very important to me since my current HG659 can achieve an Open Nat Type on my consoles with no issues or can the USG be able to do this as well? @Dochart Going with the Edgerouter 4 is not at all going to make your gaming experience any better. The software of the Edgerouter and USG is the same, the USG pairs with the UniFi controller making things easier to manage. The USG can literally handle 100's of devices no problems and is a great fit for you. I use a raspberry pi to run the controller software. Any computer running 7x24 can do the job. 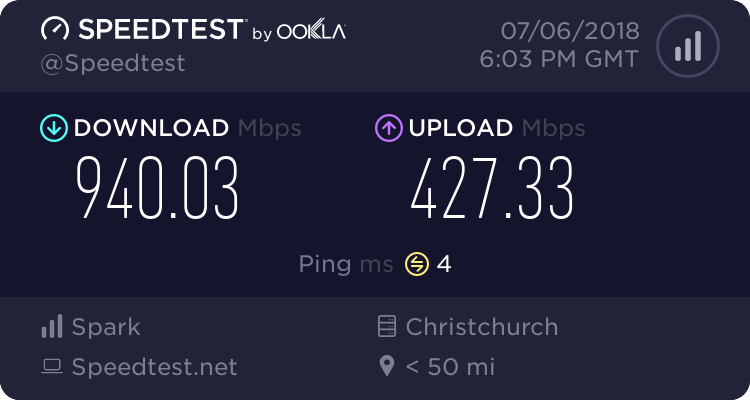 Anyone else gets 900Mbps with speedtest? I cant say much nice about the small USG on gig fiber. Using a huawei freebe gives me much more responsive browsing and higher speedtests. I have none of the IDS stuff turned on, which will hobble it down to sub hundred megabit speeds. Speedtests on the USG are about 850 best case, vs 940 on the huawei. With other stuff happening on the connection the USG is lucky to hit 650. And thats with the other stuff being 10 megabits worth of FTP traffic or similar. Also recently when trying some beta firmware on it have had constant instability, just downloading a game on the playstation would make it reboot, multithread FTP from the seedbox, and it would reboot. Back to the last release firmware and stability has resumed but still slow. Its performance is apparantly better if you get the USG pro rack mountable one, but they have just announced the unifi dream machine which has many devices in it and says that it can do gig speeds with the IDS stuff running so I would hold off till that gets released and see what else they bring out for a new gateway because the current one is just not fit for a fast internet connection IMO. Edit: you might be better off on orcon with the USG as they are IP rather than PPPoE like voyager. But its still a rather underpowered piece of gear and showing its age. @richms I think you had a faulty unit here. I've deployed many USG-3's on Gigabit connections and they work as well, if not better than existing ISP kit. IDS is not offloaded so this is why it drops speed. One of the connections one of these USG-3's is running on is actually a Voyager Gigabit connection with full IPv6 and several port forwards running. Never had an issue and looking at the portal it has over 100 days uptime.